Fracture causes heart taking pain and movement is restricted in the fractured area. Bones are vital part and should be repaired. 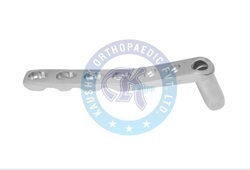 Dynamic compression plates are used to join to the broken bones. We offer wide range of compression plates which are made with apt and high grade products. 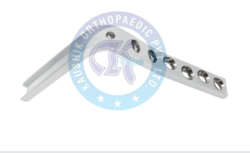 Our company is one of the reputed and well known manufacturers and exporters of Dynamic Compression Plate Broad. 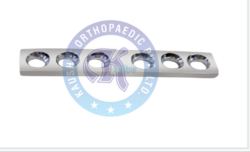 These plates are useful in distal humeral fractures, implantation of forearm and clavicle. 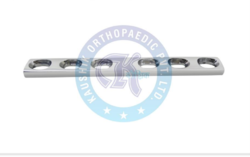 This metallic plate is 4.5 dcp hole designed and used in orthopaedics in internal bone fixation mostly after fractures. We offer our range after checking them on well defined quality parameters that ensure their reliability and optimum quality. 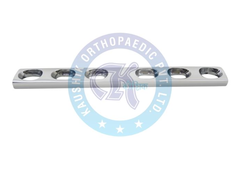 We offer a wide range of superior quality Hip Screw Barrel Plate.It is largely applicable for indicating intero-trochanteric fractures as well as in specific sub-trochanteric fractures, mid-cervical and low sub-capital fractures of the femoral neck. It is highly appreciated by our clients because of its durability, corrosion resistance, sturdiness, cost effectiveness, easy operation etc. Manufactured from premium quality raw materials acquired from our reliable vendors, these have excellent finishing. These are available from sizes 2 holes to 18 holes.